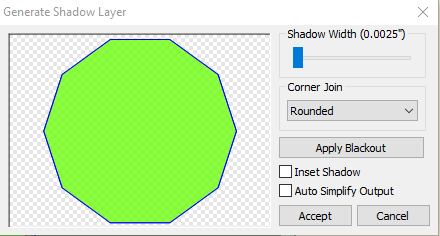 I have version 4.0.4 and when I try to inset a shadow the popup box appears and immediately starts calibrating, stopping at .7125. 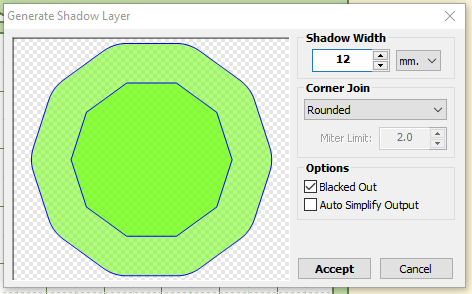 I don't even have a chance to tell it I want an inset shadow. So I slide the bar down as far as it will go but have no idea how small that is because there are no associated numbers, check the inset box and wait patiently while it recalibrates, again stopping at .7125. There no place to put the number for the width I want as shown in the videos. In fact, I have no place to put any size information. I can either accept .7125 [in or out] or not. Those are my two options. Another problem, possibly related, is that it won't break items apart. I can wait but the program goes into 'non responding' mode. Once it looked like it might have broken things apart as they had individual boxes around items, but I was unable to select and delete any individual box. Twice it said that there wasn't enough memory to do the job. I have over 467 GB of my hard drive free and plenty of ram so who put a limit on the memory and how do I increase it? I would appreciate any help you can provide. How large a detailed is your pattern ? MTC does sometime struggle with large pattern the contain a lot of detail, shape or raster content I'm not sure if there was improvement with following updates ? @dporter_az - please attach a copy of the MTC file with the shape(s) in it that is giving you a problem. I am going to suggest that it is the shape itself that is causing problems. To test that the function is working as it should, place a square on the mat, make it 6 inches by 6 inches and apply a Shadow Layer to it. If that works and does not crash, I go back to my previous comment above, the file is the problem, not MTC. If the file is the problem, you need to fix it before you can work it in MTC. But report back findings here first and then we can advise how to go about solving the problem.